Stretching in the morning totally is a great kick-start for the rest of your day! Get some movement in the body, wake up your joints and muscles, and the mind is sure to follow. That might all sound nice and dandy, but in reality, my bed rules my mornings. The soft cozy, luscious swoon of the pillows usually keeps me in bed perhaps longer than I should stay there. So, how do you beat not wanting to get out of bed in the morning? It’s easy: avoid hitting snooze and simply stretch in bed! Throw back the covers (or don't!) and enjoy these seven morning yoga poses from the comfort of your sheets. Share your bed with a partner? You can both enjoy these moves together! Bring your knees to your chest and give yourself a little good morning squeeze. Lightly rock from side to side or in small circles, subtly waking up the hips and low back. Bring your knees over your hips, shins parallel to the bed, put your arms out wide, and slowly drop your knees to one side as you gaze over the opposite shoulder. Keep your shoulders grounded on your bed and breathe as you allow your hips and low back to awaken even more in this stretch. On an exhale, bring your legs back to center and drop to the other side, exchanging your gaze over the other shoulder. An especially great stretch for runners! Lying on your back bring one knee to your chest and hug it tight. As you inhale flex the foot of your straight leg and as you exhale point the toes of your straight leg. This will wake up your glute (bum) region as well as your ankles and other leg muscles in between! Hold this stretch for three deep breaths and switch legs. Roll up to a seated position on your bed, legs crossed comfortably. Take a deep breath, and as you exhale, turn so you bring your right hand to your left knee, looking behind you. Inhale back to center and exhale to the other side of the body. Take a few breaths here. Creating movement in the spine is what will really help wake you up in the morning! From your seated position, start by pressing your left side ribs out over the left hip, slowly roll the chest forward over your crossed legs and then bring your right side ribs over the right hip, creating a circular motion with your upper body. As you round the back to complete the circle, hold on to your knees or shins for support and allow your upper back to release. Flow with your breath for a couple rounds, then switch directions. Come to your hands and knees. On a squishy bed, this position may be more comfortable stacking your wrists over your knuckles instead of an open palm. This will protect the wrist and shouldn't hurt your knuckles, since you're on your bed. Come into a Table Top position with your back and take a deep inhale; on your exhale, arch your back, bring your chin to your chest, pressing through the shoulders, and tucking the tailbone. On your inhale press your navel towards the bed, looking up, allow the shoulders to fall slightly away from the ears as you press through your shoulders and open your chest. Complete for at least three full breaths. After Cat Cow, return to Table Top position on your hands and knees. On an inhale, extend your left leg straight back behind you, foot flexed, pressing that heel back. Here, you are lengthening the spine, so keep that leg in line with your body and allow your neck to remain straight, looking straight down, eyes parallel to the bed, shoulders away from ears. On your exhale tuck your chin and bring that leg in as if trying to touch your knee to your forehead. Do this a few times, repeat with the opposite leg. Draw your focus in on listening to your body. Use this as a time to get to know yourself better. Pause if any places feel tight, and let them ease up. Stretch with your breath to keep the mind aware, and also keep it from straying on to your day's task list. Think of stretching in the morning as your warmup for the entire day. These stretches are meant to lightly ease the body into movement, and upon completion, leave you feeling more awake and ready to get on with your day. 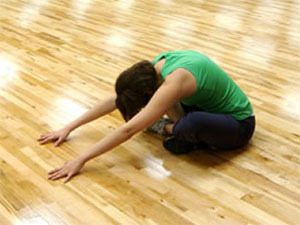 Stretching in the morning will ease stiffness, soreness, and can help diminish chronic aches and pains in the body. Take time for yourself in the morning with these yoga poses and exercises, so you can be sure to enjoy the rest of the day!